Be sure to join us for the seminal event in investigative reporting for 2017 — the 10th Global Investigative Journalism Conference. We’re bringing nearly a thousand journalists from 100 countries November 16-19 to Johannesburg, South Africa. You can view the program here and register here. You don’t want to miss this one — it will be the GIJC’s 10th anniversary and our first time in Africa. There will be over 100 sessions, all targeted at working journalists determined to dig beneath the surface. We’ve got stronger networks and better tech than ever before, plus the top journalism trainers in the biz. Come learn state-of-the-art data analysis and online digging, how to track dirty money across borders, and how to fund your investigations. Check our full conference site here. The Global Investigative Journalism Conference is the premier international gathering of investigative and data journalists, held once every two years. This year, the 10th conference will be held in Johannesburg, South Africa, from November 16 to 19, and features more than 120 exciting panels, workshops, and networking sessions, ranging from cross-border collaboration and corruption to advanced data analysis. We’re offering over 100 fellowships for journalists from developing and transitioning countries to join us. Kgosi — we will launch the conference website in a week or so, and there will be information posted on it about attending GIJC17, including links to discounted hotels and travel advice. Hope to see you there! Since I attended the last conference in Norway, I have been unable to come but assure that I will be Joburg. I am a journalist with seven years of work experience, but currently, I am on a study break and not pursuing as a full-time journalist. Is it possible for me to attend the conference, and if yes, what’s the procedure for applying? You are welcome to join us at the conference, which is attended by journalists, professors, students, NGO staff, and others. We will launch the conference website in a few days with information on how to register, transportation, lodging, and more. Hope you can make it. How I’ve always wished to attend this annual gathering but sine I’ve applied on time this time hope to be in J’burg in November! I am a Tanzanian jouranlist working with the Daily news, an english daily broadsheet. I am a member of the Cross Borders Africa investigative journalists network started by a group of 25 africa seniour editors who attended a Pan african investigative journalism course at wits university in dec. 2012 when the US was launching africa media hub project. I would love to attend this conference to gain new insights on investigative journalism. i am a sub editor doing international features editing. i hold a second class diploma in journalism, a law degree and i am currently doing my master of arts degree in international cooperation and developemnt at tyhe open university of tanzania. i believe this course will suit me because i will have time to interact with many scholars from around the world. kidly let me know if i can be eligble and get a fellowship/scholarship.funds to attend. regards. hope am gonna be there!!! actually i will like to attend, i am a working journalist from Nigeria Africa, but where do I start from? my transport ,accommodation and other logistics, who will take care of them? I am a broadcast media journalist from the southern part of India. What are the norms to participate in this conference? l IKE TO BECOME A WORLDWIDE MEMBER AS I AM AN INVESTIGATIVE JOURNALIST BASED IN INDIA. 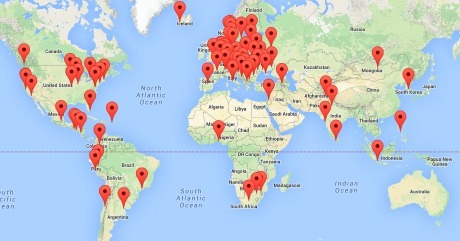 Thank you for your inquiry about membership in the Global Investigative Journalism Network. GIJN is a training and professional development association, and membership is limited to nonprofits, NGOs, and educational organizations. You can find membership criteria listed on our website here. Regardless, you and your colleagues are welcome to be part of the broader GIJN community by joining our Facebook and Twitter feeds, LinkedIn group, and Global Listserv, and by subscribing to the GIJN Bulletin. Also, our Help Desk and Resource Center have useful guides for journalists worldwide. Hi, I am a journalist from Bangladesh. I have applied for the fellowship. Do I have to apply for the conference separately or is this all? That’s all you have to do. Winners will be announced August 1. Good luck! Yes, it is co-hosted by the Investigative Journalism Programme of Wits University in South Africa. More at https://gijc2017.org/. Hello, I am a Journalist from Nigeria. I have also been privilege to cover events in Ghana and Benin-Republic as Cross-borders reporter. This fellowship conference appears exciting and it will be another milestone for me in my 10 years sojourn as Journalist. Thanks in anticipation of your consideration. Please, should there be any need to come up with any other thing that may enhance my eligibility or my application, do not hesitate because i can’t wait..
HI, this is Yoi Tateiwa of Japan Center for Money and Politics. I’m also the Executive Editor of a nonprofit investigative journalism called Seeds for News Japan. I’m honored to be taking part of this special conference. Hope to be connected with all of you at the conference.